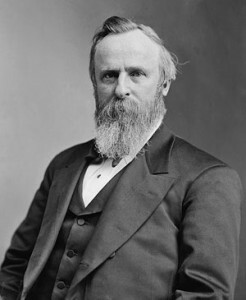 Republican Rutherford B. Hayes had won Oregon’s popular vote in the presidential election of 1876, and the state’s three Republican electors marked their ballots for Hayes. John Watts, one of the Republican electors, however, was a postmaster, an appointed position he did not resign until after his election to the Electoral College. The Democrats did not like this maneuver. The U.S. Constitution requires that electors not be elected or appointed officials. Governor Grover, a Democrat, declared Watts ineligible for the elector position and replaced him with C. A. Cronin, the top Democrat vote getter in the presidential elector race. Cronin unilaterally declared two votes for Hayes and one vote, his, for Samuel J. Tilden, the Democratic candidate for President. The Republican electors disputed the legitimacy of the new appointment and cast their three ballots for the Hayes ticket as they had planned. Several other states’ electoral college returns were also disputed in the close 1876 presidential election, so the U.S. Congress established an Electoral Commission to sort things out. On February 23, 1877 the commission voted on the conflicting Oregon returns. The states’ ballots were awarded to Hayes, who eventually eked out the election by one electoral vote, 185-184.